It was originally established in 864 A.D. as the Tendai sect (天台宗) Buddhist temple, but it was restored twice – initially during the Genroku era, then followed by the restoration in 1776 A.D. by Buson (与謝蕪村). It has been converted to Rinzai sect / 臨済宗. When the legendary poet, Matsuo Basho (松尾芭蕉), traveled to meet his friend in Kyoto, he stayed in the hut belong to this temple; therefore, the hut was later called Basho-An (芭蕉庵). The beauty of each garden reflects the vision and the ability of a gardener. Here we see the white sand of Karesansui style garden next to the rhododendron shrubbery. We also see the stairs made of stones leading to the hut above, and there are deciduous trees planted along the stairs. There is a evergreen tree next to the stone Tōrō. 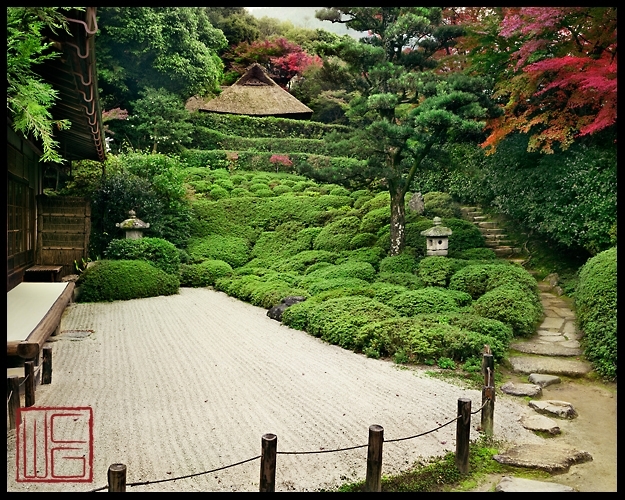 The gardener here had carefully planed (and planted) everything to achieve the balance and harmony. The talented gardeners are like the visionaries, being able to envision the future scenery of each garden. In this garden, the different seasons are represented and covered. The evergreen tree and Karesansui withstands the whiteness of Winter. Rhododendrons may show the splendor during Spring. We can see the different shades of greens during Summer months, and we can witness the glory of the deciduous trees turning their leaves into various colors reminding us of the sunset… and so on.